This Christmas wasn't exactly a "traditional" Christmas for Taylor and me. Don't get me wrong, it was a wonderful, eventful Christmas, but far from anything we've ever really experienced before. Our trip to DC ended on the evening of the 22nd, which meant that we had to jam-pack all of our Christmas festivities in on the three days that followed. 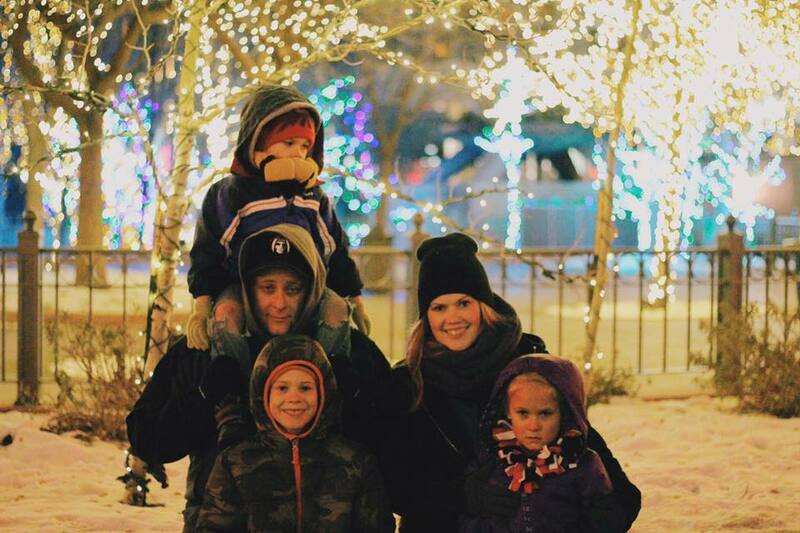 We started things off the right way by heading up to Temple Square in Salt Lake to see all of the temple lights with my big sister and her cute family. (I know, cliche, but sometimes things are labeled as "cliche" because they're awesome, Okay?) The lights were great, but I think we officially decided that next year we're not going to wait until the end of December to roam about in the bitter cold of winter-- we'll probably go as soon as the lights are put up just so we don't freeze to death again. It would have been fine if all of our warm clothes weren't packed up in a storage unit in Provo. But they were. So we were wearing inappropriate attire for the harsh temperatures. (In other news, we get to move into our new home this next week, which means we'll finally have access to all of our possessions again! Whooo hooo!) My nephew literally made it two minutes into our endeavor before he collapsed on the ground and decided he just wanted to go home. It was hysterical. Our temple light adventure ended up being a lot more complicated than we intended it to be. We went to a restaurant in downtown Salt Lake named Charlie Chow's (five stars) and ate our weight in mongolian barbecue. (Seriously, hit that place up because it's amazing.) We had decided to ride the frontrunner up to Salt Lake in order to avoid dealing with cars, traffic and parking, but long story short, we ended up missing the train on the way back and were forced to ride the trax to Draper (where the line ends) and have people come and pick us up. But somewhere along the way we had to stop the train and hold the doors open so my nephew could pee between a garbage can and a bush (he peed for seriously four minutes and I don't know where he even held all of that liquid) in order to prevent peeing his pants. And as if that weren't enough I was about ready to pee my pants once we got of the train-- and we drove to three different gas stations (all of which were either locked or had no bathroom) before finally going to Walgreens to use the restroom. We didn't get home until after midnight. We'll do better next year. Christmas day was magical! We woke up to mountains of snow in our backyard. I've never seen it snow so much in one night-- it was just funny because thirty minutes away from our house (in both directions) there was hardly any snow. Like, at my grandparent's house in Draper, there wasn't even half as much snow as there was at our house. Nonsense. I like snow as long as I don't have to go anywhere or do anything. And I like snow for Christmas. But I get sick of snow really fast because it makes me cold and it's really inconvenient. And it broke my windshield wipers. But anywho-- Christmas day is always extra special for families who have missionaries out serving in some random location in the world. My younger sister is currently serving as a missionary in Iowa and she's officially been on a mission for six months, which means she's only got a year left. I swear she just left. But I also feel like she's been gone for too long. We got to sit and talk to her via skype for a whole hour and by the end of it she had me leaking tears out of my eyeballs. (Which I didn't necessarily approve of, I just couldn't help myself...) I miss that sweet girl so much! But she is happy and such a cute little missionary so I guess I'm okay sharing her with the people in Iowa. The holidays are sweeter when I get to share them with Taylor. I'm really looking forward to spending all the holidays with him for the rest of forever. But I suppose with all of the Christmas celebrations officially coming to an end it's time to start thinking about some new goals and aspirations for 2016. I can feel big things coming in the year to come and I can't wait to see what sorts of surprises lay in wait. I hope everyone had a merry, merry Christmas.